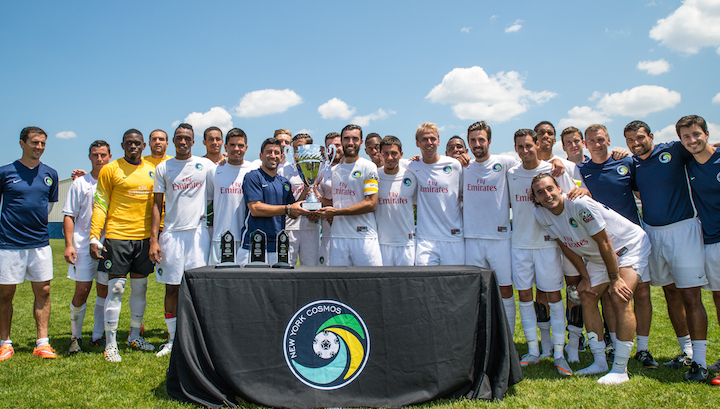 Prior to their trophy presentation ceremony on Saturday for winning the NPSL's North Atlantic Conference, New York Cosmos B defeated Seacoast United Phantoms 7-0 at Mitchel Field. HEMPSTEAD, N.Y. (July 11, 2015) – New York Cosmos B had already won the NPSL North Atlantic Conference title, but there was no letting up as they put seven past Seacoast United Phantoms at Mitchel Field on Saturday. Miguel Herlein hit four of them, and his initial treble was completely assisted by Ruben Bover, who was named Team MVP for the season and Man of the Match. “Ruben is a special player, there's no question about it,” said head coach Alecko Eskandarian. “He's a guy that can change the match any time that he touches the ball. On top of him having such special talent, he's the hardest-working player as well. He runs all over the place, moving for his teammates, and he showed his class today." Eskandarian presents Bover with his Team MVP award. Not only was it the team's eighth straight win, it was their fourth consecutive clean sheet, with two of the goals coming late from substitutes Ibrahim Diaby and Gonzalo Rodriguez in sweltering conditions. Eskandarian was delighted with the day's work. “We've stressed that every minute of every match is a minute to improve and develop," he said. “I never want the guys to take their foot off the gas. It's always about being a better player. It's not about running up the score or anything like that, it's just about playing well, taking advantage of our opportunities, and not taking any shortcuts." 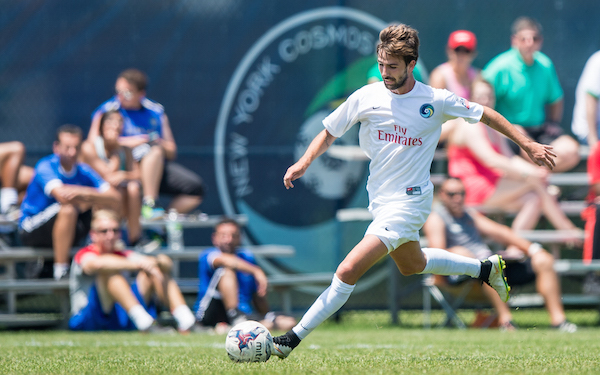 Though it was Bover and Herlein stamping their names on the match this week, Cosmos B has had contributions from all over the squad in their inaugural season. Last week forward Jension Brito netted a hat trick of his own. U.S. youth international Haji Wright has also featured on the attacking side, though he is in California this weekend playing for his country's U-18 team in the NTC Invitational Tournament. “Every week our coaching staff has a difficult decision to make regarding who to play, because we have a lot of guys that really work their butts off and prove their worth in training," Eskandarian said. “We're lucky to have such a deep squad and it's always a good feeling to be able to reward the guys that didn't start, but have shown a great work ethic and quality throughout the weeks and months." It was actually the Phantoms who had the first effort of the game, Francisco Lozano heading over after seven minutes. But that would be their only attempt, compared to the Cosmos' 26. Travis Pittman headed straight at goalkeeper Ryan Carpenter in the 18th minute, before the deadlock was broken four minutes later, Herlein finishing at the back post after good work by Bover on the left. Julian Stahler picked out Jenison, who tried to go around Carpenter but the goalkeeper recovered. Then in a flurry of goalmouth action, captain John Neeskens, Jenison and Stahler all had efforts but the Phantoms survived. Herlein was a menace, and Carpenter stopped one of his shots in the 37th minute, but could do nothing three minutes later when the Portuguese striker smashed in from Bover's cutback. Portuguese striker Miguel Herlein netted four goals against the Phantoms on Saturday. The Phantoms replaced Carpenter with Andrew Pesci at the interval but he was soon picking the ball out of the net, and it was Herlein's hat trick goal on 49 minutes, a simple finish after more great play by Bover. Herlein wasn't finished there, and when his shot was well saved five minutes later, Jenison was on hand to add to his own treble from last weekend. Herlein did get another of his own after 56 minutes, a beautiful curling shot from the edge of the box into the far corner. Bover was unable to get on the scoresheet though, and he was frustratingly denied by the impressive Pesci. The Cosmos had to wait until the 85th minute for their sixth goal, when substitute Diaby dribbled past two defenders and fired low into the net from the edge of the area. Rodriguez wrapped up the scoring with the most spectacular goal of the day, a long-range shot that fizzed in off the frame with two minutes to go. 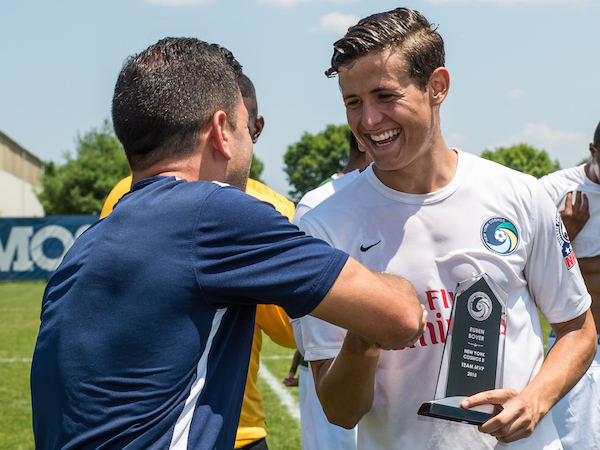 Cosmos B were presented with the conference trophy after the match, but Eskandarian is looking beyond that to the playoffs. “It's great. It's a special feeling and I'm happy for the team because they earned it," he said. “They worked very hard and put together a great regular season. Obviously we still have one match left but to be undefeated thus far is definitely an accomplishment. 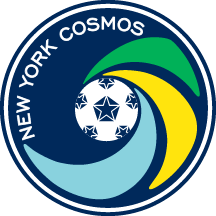 Cosmos B are straight back in action on Sunday, July 12 at 11 a.m. ET, this time at Hofstra Soccer Stadium. They will complete their regular season against Greater Lowell United, whom they beat 6-0 on the road last month. “We'll change a lot of the lineup and get some fresh legs in there,” said Eskandarian. “The guys worked very hard and it was very hot today. It'll be a tough game. I know Lowell have struggled this year but they definitely have some talented players.